This week is Herbal Medicine Awareness Week, which has been organised by the National Institute of Medical Herbalists to raise awareness about the many benefits of Herbal Medicine. Herbal medicine quite simply uses plants and plant extracts in the treatment and prevention of disease. People have been using plants to cure illness for thousands of years. In fact, herbal medicine and orthodox medicine share a common root: it was not until around 200 years ago that scientists first began to extract individual active constituents from plants in order to produce orthodox drugs, and thus modern medicine and herbal medicine parted company. Most of the pharmaceutical drugs used today are still based on plant constituents, which have been extracted or synthesised in a laboratory. For example, digoxin from foxgloves is used to treat heart disease, morphine from the opium poppy is a powerful painkiller, vinchristine from periwinkle is used in chemotherapy, and ephedrine from ma huang is an ingredient in many over the counter cold and flu medicines. Herbal medicine, however, still uses the plants themselves, which contain many constituents, ‘as nature intended’. The main active component of the plant is balanced by these other constituents, which support its action or help to reduce its side effects. In recent times, modern research methods have been used to establish the safety and effectiveness of herbal medicines. Herbal medicines are now widely available over the counter in most pharmacies and health food shops. For many people with minor health problems these remedies are adequate to meet their needs. However if you are suffering from a serious illness or are unwell for any length of time, if the remedy you are taking is ineffective, or if you find yourself buying more than two or three products, it may be time to get some professional advice: It is important to ensure that the problems you are experiencing are correctly diagnosed, and that you are taking the right remedy at the right dosage. Medical Herbalists are trained in the same diagnostic techniques as orthodox doctors but also incorporate a more traditional approach to healthcare. Herbal Medicine is a holistic treatment, which means it is concerned with identifying the cause of the problem rather than just the symptoms, and treating the person as a whole and not just the illness. Medical herbalists are trained to identify any potential interactions between orthodox and herbal medicines and to know when a condition is best referred to a doctor or another therapist. Depression, anxiety, and sleep disturbance. Poor circulation and varicose veins. Digestive problems, constipation, and IBS. Irregular periods, PMS, infertility and menopausal symptoms. Skin problems such as varicose ulcers, eczema and acne. Modern medicine has undoubtedly saved and changed the lives of many people, and still remains an essential part of our healthcare system. However, more and more people are looking for a safer, more natural and holistic approach to healthcare, and many (especially those suffering from complex, recurrent or chronic problems) achieve much better results from herbal medicine, either alone or in conjunction with another form of treatment. The summer seems to have arrived at last, and many people are hoping for a long sunny summer here in Ireland, while others are looking forward to jetting off to sunnier climes. Either way, now is the time to start thinking about the importance of sun safety. As most people are aware, exposure to the ultra violet (UV) radiation in sunlight causes skin damage, which can lead to the development of skin cancer. The number of new cases of skin cancer in Ireland has increased by 36% in the last decade; and the incidence of malignant melanoma, the most aggressive type of skin cancer, has risen even more sharply, affecting 84% more men and 48% more women than 10 years ago. The widespread use of sunbeds is partly to blame for this dramatic increase; however, there is also a perception that exposure to the sun in Ireland is not as harmful as sun exposure abroad, and many people do not use adequate sun protection. In fact up to 85% of the sun’s UV rays do get through even on cloudy days, and Ireland now has the third highest incidence of malignant melanoma in Europe. When the skin is exposed to the ultra violet (UV) radiation in sunlight, the damage caused triggers specialized cells to produce a brown pigment called melanin which gives a tanned appearance. Repeated exposure to sunlight can lead to malfunction of these cells which results in the appearance of brown spots, patchy pigmentation and an increased risk of skin cancer. A for Asymmetry – any change in the shape of the mole. B for Border – any mole with a rough or irregular edge. C for Colour – any mole with an uneven colour (light brown to black) or colour that changes. D for Diameter – any mole that changes size or is larger than the blunt end of a pencil (6mm). Exposure to UV radiation can also damage the skin in other ways. In the short term there is the risk of sunburn, which can be quite severe in some cases. In the longer term, damage to the skin’s structure causes a thickened and wrinkled appearance. In some cases, excessive sun exposure can cause a particularly nasty form of eczema called chronic actinic dermatitis in which the skin becomes permanently thickened and inflamed with numerous scabs. As with all things, the key is in practicing moderation. 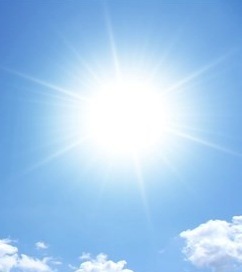 Our main natural source of vitamin D is that which is synthesized in the skin on exposure to sunlight, but around 15-20 minutes of sunlight per day before 11 a.m. is sufficient to provide adequate levels of vitamin D. Anyone who is outdoors in sunny weather after 11 a.m. or planning a holiday to a warmer climate, should protect their skin from the sun’s harmful rays by wearing a hat and applying a high factor sunscreen to exposed areas every 2 hours. It is advisable to stay in the shade between 11 a.m. and 3 p.m., and to avoid sunbeds at all costs. If you do overexpose your skin to the sun there are some natural ways of helping to repair the damage. Make sure your diet includes plenty of nuts, seeds and wheatgerm, which are high in essential fatty acids, zinc and vitamin E, which promote healing of the skin. Aloe vera gel with a few drops of lavender essential oil mixed in is excellent for restoring the skin after exposure to the sun.